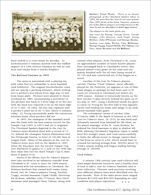 The cover and table of contents for Issue #27 are shown below. 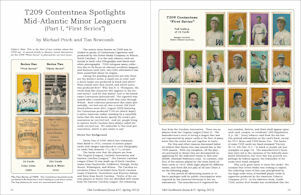 1) "T209 Contentnea Spotlights Mid-Atlantic Minor Leaguers (Part I, 'First Series')" by Michael Peich and Tim Newcomb. 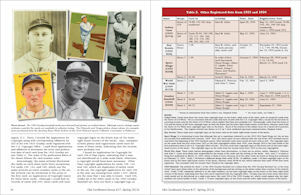 Two long-time collectors and researchers provide a detailed look at this two-part minor league set. 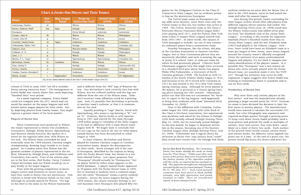 Part I, printed in this issue, takes a close look at the 16-card T209-1 color set. The much larger black and white set will be continued in Issue #28. 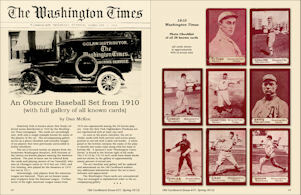 2) "The Washington Times: An Obscure Baseball Set from 1910" by Dan McKee. This very rare and thinly collected set is profiled by Baltimore collector and part-time dealer Dan McKee. 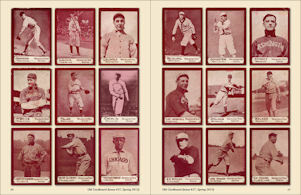 A complete gallery of all twenty-six known cards is presented for the first time ever, along with references from the Times newspaper files that feature the same images as the Walter Johnson and Ty Cobb cards from the set. 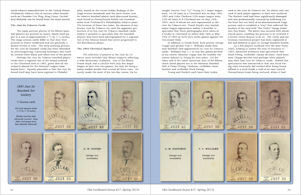 3) "Goudey’s 'Registered' Card Sets and the Artists Who Produced Them" by Benjamin Lee. 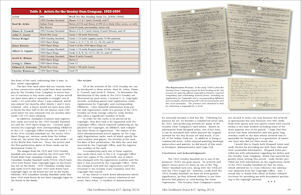 High-school-junior Ben Lee reports the results of his research at the U.S. Patent Office in Washington, DC related to the registration of the Goudey Gum company's earliest card sets. The several artists named in the copyright applications are tabulated along with examples of some of the paperwork used in the copyright process. 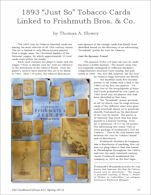 4) "1893 'Just So' Tobacco Cards Linked to Frishmuth Bros. & Co." by Thomas Slowey. 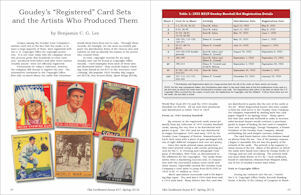 Based on the recent discovery of a Just-So Tobacco poster featuring cards of stage actresses, card researcher Tom Slowey links the brand for the first time to the sponsor of the "Just-So" baseball set. 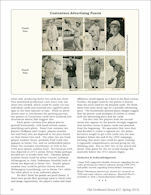 A gallery checklist of all of the known cards in the baseball set is also provided. 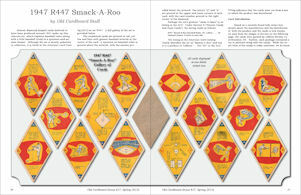 5) "1947 R447 Smack-A-Roo" by Old Cardboard Staff. 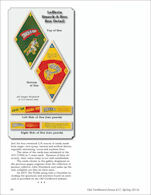 This "R-card" set produced around 1947 is profiled along with a full gallery of all 16-cards and images of the box from which the cards were cut. 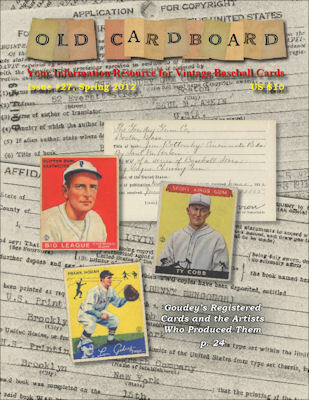 Barely known to the hobby, the issue's main "claim to fame" is its listing as set R447 in the American Card Catalog. 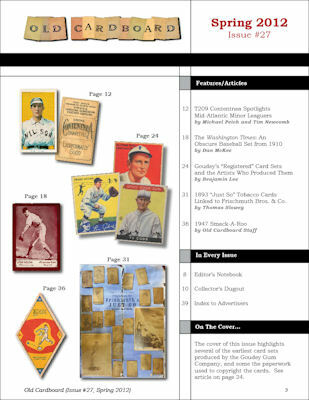 In addition to the above articles, all issues of Old Cardboard magazine include regular sections of Editor's Notebook and Collector's Dugout as well as informative messages from our sponsors. 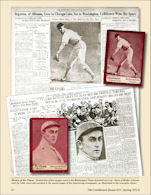 To order your copy of this and previous issues of Old Cardboard, go to subscription details.